Let me begin by saying I was very skeptical. Raw chocolate pie with bananas and avocado as the filling did not sound especially appealing to me. However, I took a chance and made this for my boyfriend for Valentine’s Day. He is not a raw, gluten-free, vegan type guy. I was worried this was going to taste healthy. When I want chocolate pie, I don’t want it to taste “healthy”. To my great delight, I was incredibly impressed, and so was he. This recipe is easy and truly scrumptious. It tastes decadent and sinful and the fact that it is full of healthy stuff makes it so much more fun to eat than the typical chocolatey dessert. 1. 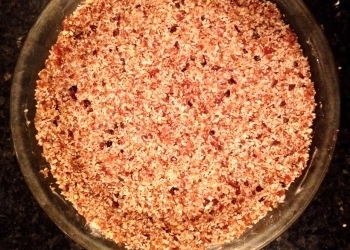 Lightly coat bottom and sides of 10-inch glass pie pan with coconut oil. Set aside. 2. To make crust: Combine pecans, dates and 1 cup coconut flakes in blender or food processor; process until mixture is crumbly. Add half of cacao nibs and pulse until mixture starts to stick together. Press mixture into pie pan to form the crust, and place in freezer to chill. It’s okay if the crust seems a little loose, but add more dates or some coconut oil for stick factor if it won’t settle in with firm palm pressing (I spent several minutes on this). 3. To make filling: Halve avocados, remove pit and scoop out the flesh. Combine avocado flesh, honey, maple syrup, coconut oil, vanilla, cocoa powder and bananas in food processor or high-speed blender. Process until very smooth and creamy, occasionally scraping sides of food processor with rubber spatula; add up to 1/3 cup warm water 1 Tbsp. at a time, if necessary, to thin. 4. Transfer filling to crust, smoothing top. 5. Decorate as desired. Scatter remaining 2 Tbsp. coconut flakes and cacao nibs on top of pie. Arrange pecan halves around outside of the pan. Cut strawberries or bananas into pretty designs. Chill 1 hour (or until firm) before serving. My pie tasted best the next day after it had been in the fridge overnight. It was just as delicious with tea for breakfast a couple of days later (perks of being an adult!). There are some studies that show baked sugar and flour products cause an immune reaction in our gut. The body sees these products as foreign invaders and launches an attack on itself. This is one possible factor in the rise of celiac and gluten intolerance as well as type II diabetes in this country (all autoimmune responses): we love our bread, cake, and cookies! This recipe is raw and by being blended is partially broken down already, so it should be easy to digest and absorb the maximum amount of nutrients. No bloat, fatigue, spacey, sugar rush, sugar cash, anxiety feelings for us! 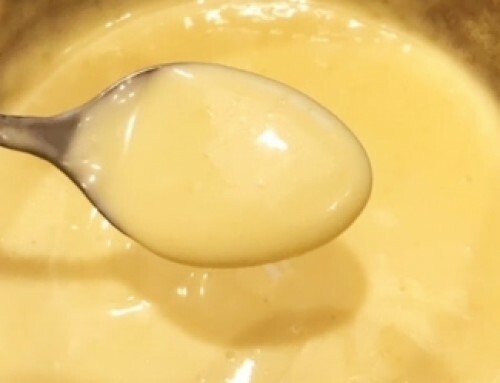 However, this is still dessert, and still sugary (albeit honey and maple syrup sugar is better than white sugar), and high in calories and healthy fat– but if you’re looking for a great way to sneak some antioxidants, fiber, and protein into creamy chocolate dessert, this is your recipe. This is your recipe even if you aren’t! Just make it. Special thanks to my dear friend Emily W. for sending me this recipe (the version here includes my personal tweaks). One mistake we often make that can lead to decreased fat metabolism and poor digestive function is eating the wrong things in combination. Sugar, dairy, flour, and cold (like ice cream) can all potentially impair the way our bodies digest food and the way we use it for energy or store it as fat. In Chinese Medicine, sugar, dairy, white flour products, and cold foods all impair the function of the spleen (corresponding to the pancreas, digestive enzymes, etc. in western medicine). When the spleen system isn’t working well it makes us feel tired, bloated, gassy, spacey, anxious and leads to weight gain. To avoid this, it is best to limit consumption of these foods, and not eat them all at once. The typical American dessert (cake, ice cream) is at least 3 of these things if not all 4! 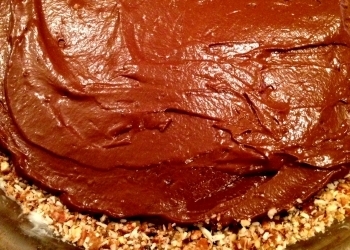 This chocolate pie recipe has some sugar, but no refined flour or dairy. This recipe contains many of the superfood ingredients I wrote about in this article: 11 Raw Ingredients You Should Be Eating. Read more about cooked food and leukocytosis/immune reactions. I made this pie literally almost as soon as I read this post. It’s quick, easy, beautiful and delicious! And I’m not breaking any rules by eating it!! Thanks Cait.